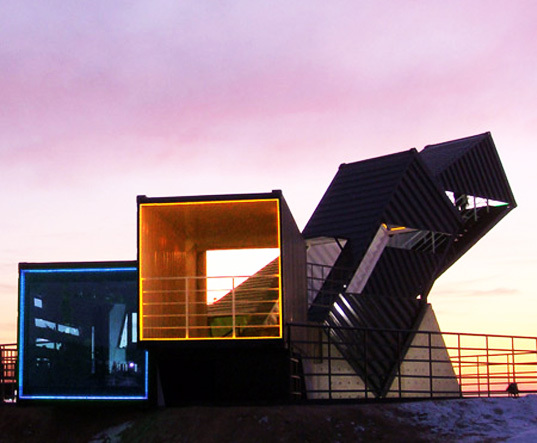 This beautiful sunset observatory made from recycled shipping containers was recently constructed in the harbor of Songdo New City in Incheon, South Korea. Designed and built by AnL Studio, “OceanScope” is a composed of five recycled containers, each one angled at a different height to provide 3 distinct views of the harbor. We often see shipping containers used as inexpensive temporary shelters, however they don’t always fit in with the surrounding environment. AnL Studio wanted to focus on the containers themselves as a design element and show others how the sturdy steel building blocks could be attractive as well. For this project they repurposed five shipping containers, installing them on solid concrete foundations at angles of 10, 30, and 50 degrees. Visitors to the harbor can walk into each container and see a different view from each one. Metal stairs were installed inside each container, and cuts along the outside walls serve as viewing windows. Thanks for sharing thats brilliant piece of art i would say!! 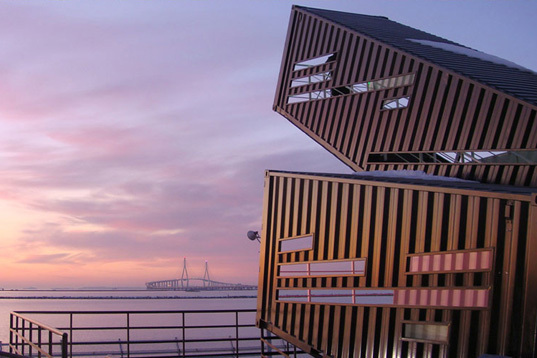 This beautiful sunset observatory made from recycled shipping containers was recently constructed in the harbor of Songdo New City in Incheon, South Korea. Designed and built by AnL Studio, "OceanScope" is a composed of five recycled containers, each one angled at a different height to provide 3 distinct views of the harbor.